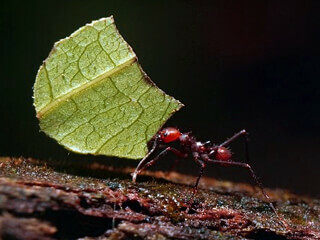 The forests of Monteverde Costa Rica are teeming with leaf-cutter ants. Although the first time I saw these insects was in Panama almost twenty years ago, they are so enthralling that the scene remains crisp in my mind. While hiking, in my peripheral view I noticed a trail of tiny bodies moving in a line. Upon closer look, I could see that most members of the team held aloft a small slice of green, like a sail. The route they marched was clearly a well-worn path, much wider than their line that stretched a ways, until it snaked up a tree. I then realized that ants were moving in both directions: some were going up the tree, and some were coming down with their leafy rewards. Leaf-cutters are a group of insects within the ant family (Formicidae). Found only in the New World and mainly in the tropics, the group consists of two genera (Atta and Acromyrmex) within the Myrmicinae subfamily, for a total of almost 50 species. Individuals are coloured in gradations of reddish-brown, long-legged, and have fiercely strong jaws and prominent spines on their bodies. Ants are known for the rare ability among animals to conduct agriculture — in addition to people, they are one of three insect groups known to do this, the other being bark beetles and termites. The group of ant farmers is known as Tribe Attini, a Myrmicine sub-group with more than 230 known species, including the leaf-cutters. All “attine” ants depend on growing fungus as their source of food. This practice of “fungiculture” is thought to have evolved about 50 million years ago. The primitive attine ants cultivate and eat fungus that grows on rotting organic matter. In contrast, leaf-cutters use only fresh plant matter as their “fertile ground”. They have a unique ability to use their powerful jaws to cut vegetation, which is how they gather leaves, fruit and flowers to bring home their nests. The evolutionary transition to this novel behaviour is thought to have occurred relatively recently, about 10 million years ago. Remarkably, to me at least, these tiny creatures are the dominant herbivore of the Neotropics. They live underground in massive, complex societies. Millions of ants may live in a mature colony that can contain hundreds of interconnected chambers where the fungus is grown. Over one-year, a study in Panama showed that leaf-cutters are able to collect about 250 kg (550 lb) of dried plant matter per colony. It is estimated that the combined biomass and consumption of a mature colony is equivalent to the ecological “footprint” of one large plant-eating mammal. 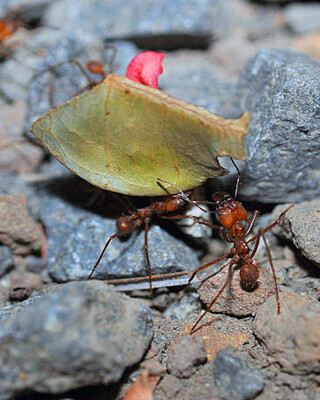 The social hierarchy within leaf-cutter colonies is utterly fascinating and has been well studied. Individuals within the colony belong to several different “castes” that have varying roles in the ant society. They can be distinguished mainly by size. The largest is the Queen, who is the only female to produce eggs. The other ants are Workers that can be divided into four different groups. “Majors” are the largest workers, also known as soldiers. Their job is to protect the nest from attack, and they are also thought to play a role in heavy lifting, such as clearing the colony’s foraging trails and bringing back large pieces of plant matter to the nest. The workers who head out to forage for plants are called “Mediae”. The next smaller workers are the “Minors”, who protect lines of their foraging relatives from enemies. Slightly smaller still are the tiniest of workers, the “Minims” whose job is to tend eggs and the fungus gardens. Leaf-cutter ants mate above ground, in large groups during a nuptial flight. Females mate with numerous males, though very few succeed at becoming a queen and creating their own colony. The lives of these insects are so tightly entwined with the fungus upon which they feed that a female must bring some of it from her maternal nest to strike off and start her own colony. A daughter queen stores bits of the fungus in a pocket within her mouth, to take with her for generating her own garden, almost like a starter yeast for sourdough bread. 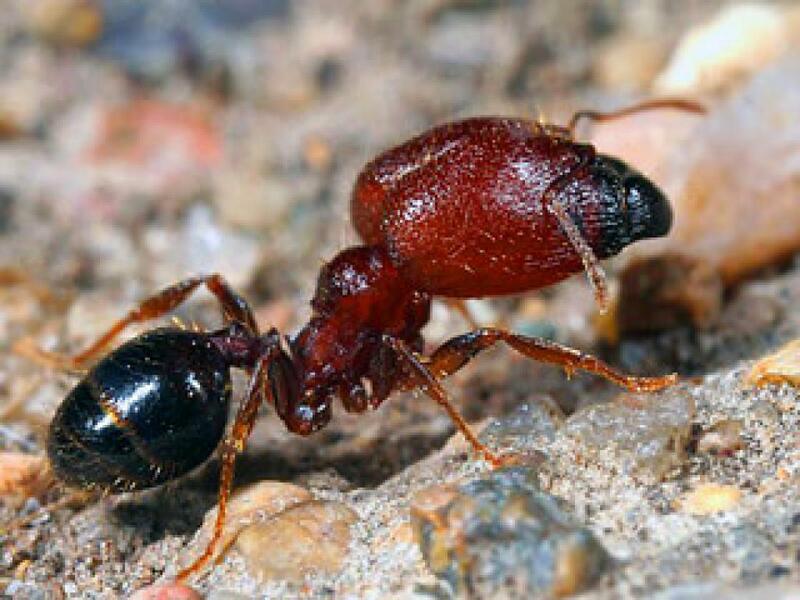 No less fascinating than the colony’s social life are the ecological dynamics of the ants’ agricultural practices in the tunnels. The foragers return to the nest with freshly cut plants to pile on top of the garden. That is chewed and mixed with ant feces and fungus to help break down the plant matter. The relationship between the ants and the fungus is a special kind of symbiosis, or reciprocal interaction, called a mutualism. This means that the organisms are mutually dependent on one another for survival: the ants rely on the fungus for nourishment, and in turn ants ply the fungus in their nests with a steady source of nutrients. There is even a third party in the relationship, a type of bacteria that grows on the ants and produces an antibiotic that helps to protect the fungus from disease and parasites. Studies of the nests have shown that they are actually divided, spatially and chemically, into two distinct kinds environments. In addition to the fungus gardens, nests contain a “refuse dump” where leftover, rotting plant matter is stored. Each of those two areas supports an entirely different community of microorganisms, whose make-up depends on the composition of the substrate. 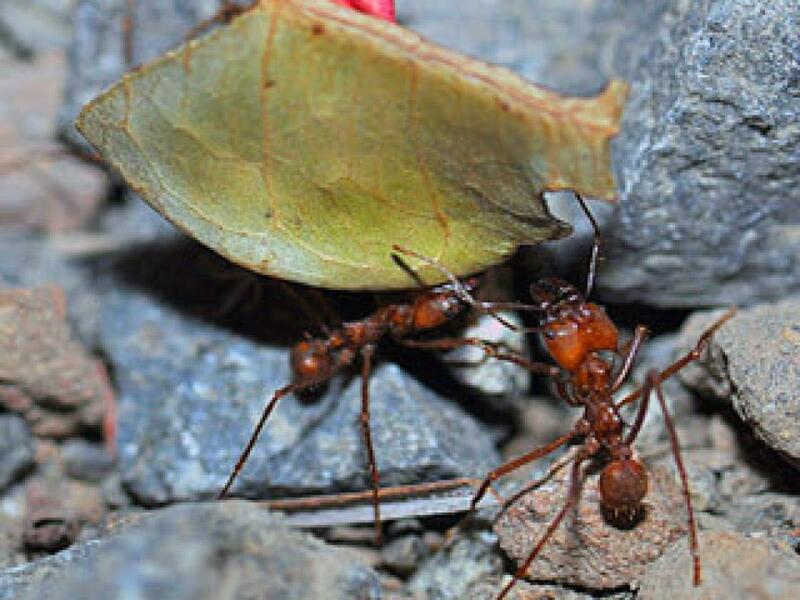 Now, when you have the magical experience of seeing leaf-cutter ants during your time at Monteverde, you will know that they are not just intriguing because they cut leaves and march in lines. They are part of an entire subterranean world of social and ecological intrigue. Herz H, Beyschlag W, Hölldobler B (2007) Herbivory rate of leaf-cutting ants in a tropical moist forest in Panama at the population and ecosystem scales. Biotropica 39: 482–488. Hölldobler B and Wilson EO (1990). The Ants. Belknap Press, Cambridge, MA, 746 pages. Weber, NA (1972). Gardening Ants, The Attines. Memoirs of the American Philosophical Society, Volume 92, 146 pages.